I was curious whether this book really covered all the festivals or parties (otherwise known as boon or boun in Lao) that go on in Laos. For example, we all know the bigger boons but what about smaller celebrations such as boon kateen / boon kathin? That one is indeed covered in the book. So I bought the book hoping for the best. Though Laos has lots of celebrations, much to my chagrin many festivals are not covered in this book. I speak specifically about the boons that are more regional or specific to certain cities or those specific to certain ethnic groups are not included. For example, there's a large Tai Lue celebration each year, the Hmong New Year in December, Wat Phu Festival in Champassak in February, That Inhang Festival in Savannakhet, That Xieng Tung Festival in Muang Sing, Luang Namtha province around October-November, or the growing popularity of the Elephant Festival in Saiyanbuli province held usually in February. All of the ones I just mentioned are huge celebrations in their respective city or region with thousands of participants with some celebrations lasting several days. Admittedly though, they are perhaps not quite as well known to foreigners. Although this book is beautifully made, it is not as comprehensive as I thought it would be. 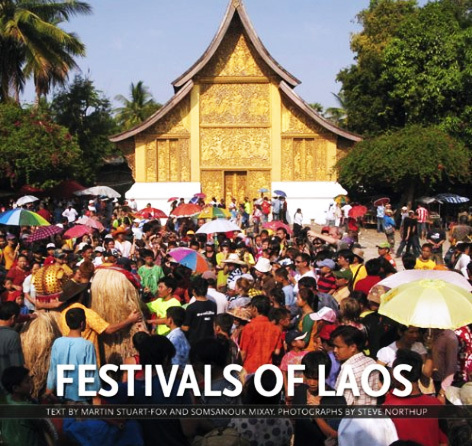 Specifically, in that it doesn’t really cover all the festivals in Laos, but instead just the more well known or major ones. And for some people, that may be enough for them. That’s really my only criticism of this book. The authors of this book have impressive backgrounds and resumes when it come to Laos studies so I suppose I expected a bit more detailed coverage and descriptions of the festivities. This book has wonderful photography throughout. The photographer did incredible work, no question there. I’m not afraid to admit, I do enjoy pretty pictures. I hope my review doesn't come across as too negative but rather my criticisms and suggestions are in part because I can see this book growing into something bigger. As I said Laos has tons of celebrations and more details about all of that could be a wonderful addition. The ones I mentioned above are examples of what could be added. Further, the festivals that the book does cover, it does well both in descriptions and with photos. Pickup a copy. It's still worth it. Lai Heua Fai, or "Boats of Lights"